Okay, I really MUST learn how to quilt. Quilting is something that has always sort of vaguely intrigued me, but now that I've seen this, I MUST learn how. How awesome is this?! 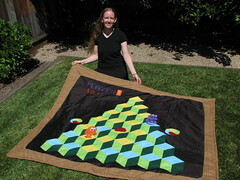 I mean, who doesn't need a Q-Bert quilt? Read more about how this quilt came to be here. Tonight I was flipping through the Signals catalog that came in yesterday's mail, and OMG. Do I need this shirt or what??? I would wear it to work on story hour days -- you laugh, but I TOTALLY would. Sadly my birthday has already passed this year, and Christmas isn't for another nine months, so I'll just have to buy it for myself. Soon, soon.